In the early times before the Christian era Korea had its own culture and spirituality which are reflected in its mythology like the myth of Tangun which includes a pre-philosophical dimension. It had an understanding of a unique God and higher spirits and also a sense of harmony within the cosmos. However culture and spirituality formally unfolded due to the encounter of Chinese characters in the first centuries of the Christian era or even before. Chinese characters had an impact similar to Greek language in European culture. With Chinese characters came the Chinese culture which was already almost 1,000-years-old under what is known as the three currents of Confucianism, Buddhism, and Taoism. Each of these currents played a specific role but Confucianism became central for the cultivation of the Self, for the values in the family and for leading well in political affairs. Although Confucianism originally appeared in China it was not passively transmitted and it took different forms in Korea, Japan, or Vietnam. Koreans, therefore, brought their own creativity. There is not just one type of Confucianism. Since Confucius’s teaching was written down by his disciples in the famous Analects Confucianism evolved throughout history. Already in the early Chinese period Mencius and Sunzi emphasized different aspects of Confucius’s thought. Koreans were always sensitive to the evolution of Confucianism in China and at the same time developed their own views which sometime have been less researched in China or in Japan. Korean Confucianism followed a path of maturation, flourishing, conflict, declines and rebirths within the almost two thousands years of its existence. The understanding of the historical context is therefore important to appreciate great Korean authors and contributions. 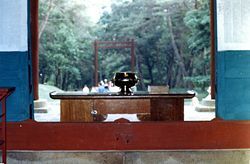 A way of assessing Korean Confucianism is also to look at its legacy which remains a source of inspiration, for example the academies or sôwôn, the publication techniques related to the Classics, the scientific research centers or the Confucian inspired poems and paintings. It is valuable also to consider the place of Confucianism in a moment when Korea has gone through many rapid changes and is playing a growing role on the international scene. Confucianism was received in Korea at about the same time as Buddhism which means that Koreans had an extraordinary effort to make to master Chinese characters and to absorb a voluminous corpus particularly in the Confucian domain with the five Classics, the Book of Changes, the Book of Rites, the Book of Odes, the Book of Documents and the Spring and Autumn Annals. In Koguryô King Sosurim (371-384) adopted Buddhism but at the same time created a Confucian university in the same year 372. King Kwanggaet’o (391-413), who extended the territory of Koguryô, left for immortalizing his accomplishments a stele written in Chinese characters showing a Confucian influence in leadership and Ethics. Paekche not only received Confucianism but played an active cultural role. Paekche is known to have introduced to the Japanese Buddhism and cultural elements like the pottery wheel and tomb building methods. But furthermore in 285 C.E. the Paekche Confucian scholar Wang In was invited in Japan. He brought with him a textbook of 1,000 Chinese characters and also ten chapters of the Confucius’s Analects. It took considerable time and efforts for Korean scholars to explore the Confucian classics but as early as the third-fourth centuries C.E. it is spoken of high learning institutions and of doctorate degrees conferred on some specific Classic such as the Book of Changes or the Book of Rites, proving the specialization. In Silla the three thoughts, Confucianism, Buddhism and Taoism were slower to penetrate. The first rulers of Silla until the fifth century were closely connected to Shamanism and resisted new thoughts like Buddhism which first was persecuted but then, contradictorily, spread quite quickly and became a unifying force for the unification of Korea by Silla in 668. Mention has been made that the Chinese classics were taught in Silla under Queen Chindôk (647-654) and that under the Unified Silla a Royal Confucian academy was created in 682 with the first state examination in 788. Kangsu who died in 692 was one of the great Confucians specializing in the Book of Filial piety and the Book of Rites and was an advisor to king Muyôl. In order to get important Chinese texts and materials Confucian scholars traveled back and forth to China and Buddhist monks as far as India. 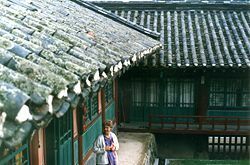 In very dangerous conditions they went through unique experiences, exchanged with Chinese and Indian scholars, intensely studied and came back to Korea with the aim of enriching Korean culture and spirituality. Before Buddhism became predominant during the Koryô dynasty the period between 668 and 918 called Unified Silla is worth to be reflected on because, differently from later moments during the Chosôn dynasty, scholars from the three main schools were open to each other and not concerned by orthodoxy. One famous example of free exchange of thoughts is the Hwarang or youth flowers, an organization of Silla that prepared elites for the highest state responsibilities. Although it started at the end of Silla it flourished during the unified Silla period and remained influential for later scholars. A characteristic of the education of such elites was that it included Buddhism, Confucianism, and Taoism, bringing in harmony their strong points. The guiding principles had been designed in 612 by the Buddhist monk Wôngwang (541?-640). Often the young cadets were studying and practicing military training in the North Korean mountains. They also composed poems that they sang. Some of these poems called hyangga have been saved and present either a Confucian or a Buddhist tone. One unique scholar symbolizes this period, Ch’oe Ch’i-wôn (857-?). Recently rediscovered by young Korean Confucian scholars Ch’oe grew in the spirit of the above mentioned hwarang. Ch’oe spent 16 years in China researching and taking on official responsibilities. He discovered first-hand the arising force of Zen Buddhism called chan in China and sôn in Korea. While Wônhyo (617-686) took the pain of analyzing numerous Buddhist sutras and was looking for a solution to the conflicts between the philosophical and religious Buddhist schools, Ch’oe Ch’i-wôn undertook an even more difficult task. He went to the core of Confucianism, Buddhism, and Taoism motivated by a quest of higher truth and wanting to show the strength of each in the spirit of their founders Confucius, Buddha and Laotzu. For Buddhism Ch’oe showed the importance of both the textual schools and the zen approach distancing itself from the scriptures in looking for a freer spirit. Ch’oe was called a cunning Buddhist or a Taoist hermit by people who did not really understand him. In fact he first admired Confucius but also loved Buddha and was sensitive to the spontaneity of the Taoists. Although Ch’oe spoke of an unchanging Tao that transcends ordinary views, he was at the same time concerned by a research of the specific Korean identity and a Korean way which he called a “profound and mysterious Tao,” such a research remaining meaningful today. Koryô dynasty founded by T’aejo (918-943) lasted until 1392. For a long period the emblematic figure was the unmarried monk or nun, temples spread all over the country stimulating religious ceremonies, studies of sacred texts. Buddhist art flourished in beautiful buildings, paintings and printing of scriptures such as the Korean Tripitaka, It would seem that Korean Confucianism was inexistent. However the flourishing of Neo-Confucianism would be incomprehensible without the patient unseen maturation and preparation by many often unknown Korean Confucians during that period. Roughly speaking Buddhists dedicated themselves to the spiritual training and enlightenment, wanting to renounce all worldly desires and attachments. On the contrary Confucians focused on this world with the will to have an impact on society. They studied to take responsibility in government and social affairs. However the relation between the two was crucial and Confucians started to become impatient with Buddhist intrusion in power and corruption of life. They did not want to remain just political counselors but to redesign society in a fundamental way. The development of Confucian ideas during the Koryô period can be divided in two periods, one from 918 to 1046 corresponding to the work of Ch’oe Sûng-no and of Ch’oe Chung, the other from 1047 to 1259 which directly prepared the reception of Neo-Confucian ideas in Korea. With Ch’oe Sûng-no (927-989), who fulfilled some institutional reforms dreamed by Ch’oe Ch’i-wôn, is heard clearly for the first time a Confucian voice that respected Buddhist principles but asked for an active role of Confucianism in the daily life of people. Ch’oe Chung (984-1068) is called the Korean Confucius for having organized a system of model academies to enlarge education and to raise the excellence of study. Such academies harmonized the rigorous preparation of examinations and the formation of character and the appreciation of poetry and social exchanges. The second period of Confucian development under Koryô saw a deepening of reflection of certain fields besides the traditional interest in political institutions. Kim Pu-sik (1075-1151), who published the Annals of the Three Kingdoms in 1145, spoke in favor of a research on history, especially Korean history and inspired scholars to come for developing a Korean national consciousness. The Book of Changes became a major source of reflection for Koreans, one of the great specialists being U Tak (1263-1342) and each generation after him produced important commentaries on that Classic. An original figure was Yi Kyu-bo (1168-1241) a Confucian gifted in the literary field and known for his poems but who was open to various thoughts like Ch’oe Ch’i-wôn and who helped Koreans to reflect on their identity in the middle of the Mongol invasions. He wrote for example the Epic of King Tongmyông related to the founder of the Koguryô kingdom. All these scholar activities helped Koreans to watch the evolution of their country both internally and internationally. The suffering of farmers and low class people, the corruption of Buddhist monks escaping social responsibilities and exploiting slaves, the disasters of Chinese invasions brought Koreans to reconsider the model of their society. When the ideas of Neo-Confucianism reached Korea in the thirteenth-century Koreans were ready to see the values of family, rigorous Ethics, social commitment, drastic reforms, transformations of institutions and economy. The defeat of Korea at the hands of the Mongols in 1267 had not only negative results. King Ch’ungyôl established a relationship with the new Chinese leaders and took with him on one of his travels in 1289 An Hyang (1243-1306) who is the first Korean to discover the texts of the famous Chinese Neo-Confucian synthesizer Zhu Xi (1130-1200). Ch’ungyôl’s successor Ch’ungsôn (1308-1313) even abdicated the throne to fully dedicate himself to a beautiful intercultural project, creating the research center of Manwôndang in the Chinese capital and bringing back 4,000 volumes to Korea. During his stay in China he called besides him several important young Korean scholars such as Yi Che-hyôn (1287-1367). Confucian ideas gave rise to a new dynamism, a royal academy was created at the end of the fourteenth century, Sônggyun’gwan where an elite was educated with great figures like Yi Che-hyôn, Yi Saek and Chông Mong-ju. Some Neo-Confucian scholars went further in their criticism of Buddhism not just criticizing corrupted practices but getting at the Buddhist doctrine itself. An atmosphere of change was now building up. General Yi Sông-gye made a coup d’Etat in 1388 and created a new dynasty, dynasty of the Yi, in 1392 with the help of some Neo-Confucian personalities like Chông To-jôn and Kwôn-kûn. Chông To-jôn (1342-1398) took a very critical stand against Buddhist doctrine, for example in his Arguments against Mr Buddha, and wanted to create model Confucian institutions. He was however opposed to a very centralized monarchy and was assassinated by a son of the king. 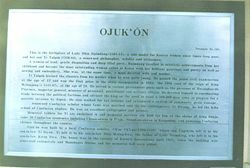 Kwôn-kûn. (1352-1409) was more moderate toward Buddhism and more intellectual. He is known for his attempt to present a Confucian Metaphysics to counter Buddhist doctrines, for example in his Heaven and Man, Mind and Nature Combine as One. Some great Neo-Confucians like Chông Mong-ju refused to cooperate with the new dynasty and were eliminated due to their loyalty to the Koryô king. The flourishing of Korean Neo-Confucianism, especially in the domain of Thought, was made possible with the maturation of ideas in the thirteen-fourteenth centuries but also with the creativity of the fifteenth century especially under Sejong called the great king (1418-1450). The beginning of the Yi dynasty was devoted to shaping institutions, implementing new rites guiding ordinary life, family rites according to Zhu Xi or funerary rites, to founding Confucian schools. Unfortunately, Buddhists were persecuted and took refuge in the mountains, Shamanists were also ill considered. Either in China or Japan there was never such an official political seizure in the name of Confucianism. The fifteenth century which prepared the rise of major philosophers like T’oegye and Yulgok is composed of two contrasted periods, one glorious and the other the source of recurring problems in the following centuries. The first period essentially due to King Sejong (1418-1450) was one of the most creative in various fields either literary or scientific. Sejong surrounded himself with capable advisers and intellectuals, establishing a scientific council called the Hall of Worthies. This humanist king stimulated accomplishments in astronomy, medicine and technology, for example the invention in 1420 of new metallic molds for printing works. He is best remembered for having given to ordinary Korean people a new alphabet, the hangul, allowing all to be educated. The last part of the fifteenth century and the beginning of the sixteenth century were plagued by an epidemic of political rivalry and factionalism due often to ambition and narrow-mindedness far from the Confucian ideal. One of the tragic peak was reached with Yônsan’gun (1494-1506) the only person not called king due to his depravity and his persecutions of Confucian scholars called purges. Such purges continued after him, one of the ill famed ones happening in 1519 when Cho Kwang-jo (1482-1519), a noted Confucian reformer, was trying to bring back ethics in politics. He remained revered by later Neo-Confucian like T’oegye and Yulgok as a model of integrity. Yi Hwang T’oegye (1501-1570) and Yi I Yulgok (1536-1584) have become known internationally as the greatest Korean Neo-Confucians of the early period of the Chosôn Dynasty. They deserve a specific attention for their deep thought and large achievements. They knew and appreciated each other, met in 1558 and exchanged letters. T’oegye is the first Korean thinker to have achieved a mastery of the Chinese classics but also of the whole Neo-Confucian tradition particularly Zhu Xi’s thought. Already as a young man T’oegye damaged his health in exploring the Book of Changes. All his life he loved learning and sharing his knowledge with his disciples. Although he had to hold official positions in the government he considered his work as a waste of time having been traumatized by the political struggles and purges, and specifically by the loss of his brother who was exiled and beaten to death. Therefore he always dreamed to return home, what he did fully in 1549, to lead a studious life in his new academy of Tosansôwôn near Andong that attracted many students and visitors. T’oegye loved dearly the Classic of the Heart, the Great Compendium of Sage Learning and the Correspondence of Zhu Xi in which he found inspiration and guidance. Among his numerous own works are well known his Four-Seven Debate with Ki Taesung, Kobong on the issues of the mind, Record for Self-Reflection, a collection of his own correspondence appreciated by Japanese Neo-Confucians and especially his Ten Diagrams of Ssage-Learning written just before his death and dedicated to present a summary of his views organized in two major parts, one related more to Metaphysical and Ethical issues and the other related to cultivation and correction of the Mind-Heart and to practical aspects of life. Yulgok is as great as T’oegye but with a different personality. While T’oegye was of fragile health, almost shy and self-effacing, Yulgok, although humble, developed a powerful determination to commit himself in responsible posts and to work at reforms. He reached top positions as minister of home affairs, economy, education or military affairs and was very much regretted by the king when he died at the young age of 48 in full activity. Yulgok was no ordinary Confucian, was admired by the practical reformers of the nineteenth century and is still admired today as it was witnessed in the international conferences in his honor in 1984 and 2005. Yulgok got selected 9 times among the top candidates at Confucian examinations but at the death of his mother he went in the mountains of Kumgang to meditate and read Buddhist scriptures, even living for one year as a zen monk. However he came back to the Confucian way but remained open to the depth of other thoughts like Taoism and Wang Yang-ming’s thought. In an exchange with a Buddhist monk he said: “What is mysterious in Buddhism cannot be taken away from Confucianism. Even more so can one search for Buddhism in giving up Confucianism?” The characteristic of Yulgok may be to have harmonized on one hand a high ideal in terms of truth, sincerity and Ethics and on another hand a will of reforms and transformation both in the individual and in society. Ahead of his time he was already suggesting a way of practical reform in education, social problems like slavery and adoption, community life, military fitness. Many of his writings, dense and precise, remain powerful like his Ten Thousand Characters Memorial or his Anthology of Sage-Learning, a mature work reflecting on the three essential dimensions of the Self, family and national governing. Many Korean scholars followed in the footsteps of T’oegye and Yulgok but not always with the same knowledge and vision. They developed schools focusing on one philosophical aspect and easily conflicting with each other. Political factionalism continued to poison relationships. Differently from the Japanese Neo-Confucians who easily criticized some Confucian views and came back to their original native thought, Korean Neo-Confucians leaned toward orthodoxy. Zhu Xi’s thought was praised by T’oegye and became an unavoidable reference. As a result Song Si-yôl (1607-1689) almost worshiped Zhu Xi and fought to death with Yun Hyu (1617-1680), not allowing any unorthodox views. The main plaza of the Seonggyungwan, the National Confucian Academy of the Joseon Dynasty, in Seoul. In the seventeenth-century Confucians developed particular researches on the rites continuing the valuable work of Chông Mong-ju (1337-1392). Rites in Korea like in Asia represent an important dimension of life in a way that was unknown to the Europeans. Rites for Asians play almost the role of laws. The fall of the Ming Dynasty in China in 1644 had harmful consequences for Korea. Koreans refused to recognize the new Qing emperors because of their admiration for the Ming. But isolating themselves they missed to witness the extraordinary accomplishments of the Chinese during that period and the discovery of Western science, technology and ideas. However, just before the fall of the Ming some Koreans like Yi Su-gwang (1563-1627) had made early contacts with foreigners and Chông Tu-wôn brought back from China a telescope and a world map in 1631. What became more and more accentuated among Korean Confucians was a tension between scholars closely attached to the Confucian tradition, sometimes some specific school, and other scholars looking for new interpretations and especially a consideration of practical life and change. This tension became a hindrance in the nineteenth century and the beginning of the twentieth century. As Montesquieu said “a great man sees quickly, far and precisely.” To see the world in a new way was determinant for the European enlightenment. In that spirit Koreans got enthusiastic in the use of the telescope and in exploring the sky. They created their own enlightenment movement. Song I-yông who built an armillary sphere in 1669 is said to have realized the rotation of the earth when the Chinese working with the Jesuits in Beijing were still rejecting the theory. Song’s works were followed by the researches of Yi Ik (1682-1764) and Hong Tae-yong (1731-1783). The practical movement called sirhak unfolded over a long period of time with fore-runners such as Yi Su-gwang, and on that foundation scholars like Yu Hyông-wôn (1622-1673) and Yi Ik who opened the eyes of Koreans to the need of substantial political and social reforms. The apogee was reached with Chông Yag-yong, Tasan (1762-1836) who combined the depth of the Confucian classics, the use of Western science and an understanding of Western thought and Catholicism. The sirhak movement is a complex movement which covers many fields but what is impressive is its enthusiasm and dedication for a lasting change of society to the benefit of the people, particularly impoverished people of the low classes. It represents a glorious page in the history of Korean Confucianism and recently either Chinese or Japanese eminent scholars have published books about it. Chinese today still speak of the visit to their country of some Korean pioneers like Park Che-ga (1750-?) and Park Chi-won (1737-1805) who wrote travel diaries for Koreans about their discoveries of the Chinese technological changes. They also remember Kim Chông-hûi (1786-1856) who made friends with specialists of textual analysis, epigraphy and art and continued a correspondence with eminent Chinese after his return to Korea. All these great achievements happened in a tormented period when King Chôngjo who was open to reforms and new ideas suddenly died in 1800. His opponents took revenge and launched in 1801 a bloody persecution against Catholicism and Western influences, a persecution which lasted until the end of the 19th century. That is why scholars like Tasan who was exiled during 18 years in harsh conditions provokes an even greater admiration for his contribution to the modernization of his country despite his enemies. 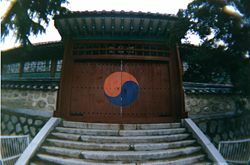 As Buddhism is still very present in Korea through its temples and sculptures Confucian places remind us of the crucial role that Confucianism played in Korean education and political affairs. These places are a symbol of Confucian serious dedication to the betterment of individuals and of society. Interior 1, Unhyeongung - Seoul, Korea. Sônggyung’gwan built in 1398 comes first to mind as the Royal academy where trained the leaders of the country. One can still see today the rooms where candidates prepared their civil servant examination. The grounds of Sônggyun’gwan hold a shrine dedicated to Confucius called Myôngryundang where every year is performed a ceremony in honor of the Master with the clothing of ancient times and the performance of Classical court music. There have studied all the great thinkers mentioned before like T’oegye, Yulgok or Tasan. The palaces of Seoul tell much about past history like the Kyôngbok palace built in 1394 and recently beautifully restored. 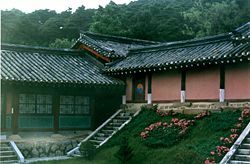 In one of them, the Changdok palace, was located the famous Kyujanggak created by King Chôngjo in 1776 where Tasan studied. It was at the same time a library, a research center and an institution of royal advisors. There exists a beautiful painting of it by Kim Hong-do (1758-?). All the archives and precious documents have been preserved in a newly built Kyujanggak on the grounds of Seoul National University in 1990. The Kyujanggak carefully protects early printed royal books which often exist in a unique copy, 81000 Korean volumes and 67 000 Chinese volumes. It is a symbol of excellence in learning and serving the country. Famous also are the private academies which flourished in the sixteenth century. Ch’oe Chung had already created model schools in the eleventh century but what was supposed to be the first sôwôn was the Sosu sôwôn in Punggi which received a royal charter in 1550 and was presided by Toegye. The most famous one is the academy of Tosan sôwôn near Andong established by T’oegye. 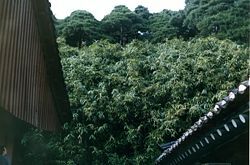 Many pavilions were built within nature combining little mountains and water. Such academies tell us about the atmosphere of study far from the struggles of the capital. T’oegye knew about the model Chinese academy of Yuelu created in 976 and where Zhu Xi taught. Many smaller academies remain to that day all over Korea although the Taewôn’gun closed them at the end of the nineteenth century. The Korean Buddhist scriptures of the Tripitaka preserved in Haeinsa are known world wide. Less known are the Confucian classics treasures that still exist in Korea despite the numerous destructions due to fire, wars and tragedies. Europeans pride themselves on the early printed books of the Renaissance but Koreans, like the Chinese, very early mastered the printing techniques and many examples can still be admired. 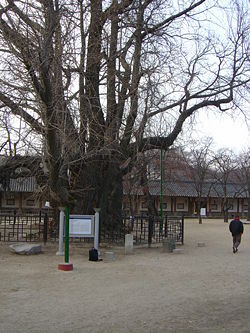 One of the stands of trees on the old campus of the Seonggyunggwan, the National Confucian Academy of the Joseon Dynasty, in Seoul. South Korean Natural Monument #59. Also many early printed books of Confucian classics have been preserved. Among them one finds the Evaluation of major events in China, 1420, the Explanation of the commentary on the Spring and Autumn Annals by Zuo in 1431 or the Comprehensive Mirror for aid in government, 1436. The dates of these documents show that they correspond to the reign of King Sejong who improved the printing techniques in 1420 and 1434. Another source of studying past Korean Confucianism is art. The most significant paintings related to the beginning of the Chosôn dynasty go back to the fifteenth and sixteenth century and allow to vibrate to the way of thinking of that period. The eighteenth and the nineteenth centuries are also very rich to perceive the changes in Korean society, to observe people’s ordinary activities and to visualize the influence of the sirhak ideas. 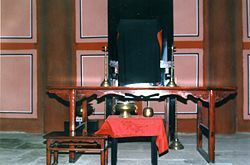 Korean Confucianism was not just concerned by theories but by techniques and sciences. Already King Sejong in the fifteenth century stimulated scientific discoveries: sundial, gnomon to measure the length of the year, automatically striking clepsydra, rain gauge… Science developed at that time in Korea not just for pure knowledge but for the well-fare of people. Later on in the seventeen-eighteenth centuries Confucian scholars were fascinated with Western science and made telescopes and armillary spheres to develop their knowledge in astronomy. Tasan constructed a floating bridge for the king to cross the Han river in going to his new city of Suwôn. He invented a crane to lift materials in the process of erecting the fortress of Suwôn. This cleverness proves how some Korean scholars could harmonize their Confucian vision with the challenges of technical development. It is also unique in world history how great Korean Neo-Confucians scholars got interested on their own initiative not only in Western science but also in Catholicism. They met in 1779 in a Buddhist temple at Ch’ônjinam to discuss about various documents brought back from China and then made the foundation of the Korean Catholic church. The Chôltusan museum in Seoul exhibits many books, paintings, and artifacts related to that meeting and to the Catholic persecutions of the nineteenth century. Like in every country the fast modernization in Korea makes it difficult to the young generation to appreciate the legacy of their Confucian tradition which would require a precise and objective reflection. The coming to Korea of Western ideas and Catholicism, although it inspired elites, drew resistance and hostility from Neo-Confucian authorities. Nothing similar to the Japanese Meiji happened in Korea. The repeated persecutions against the Catholics and sporadic battles fought with American and French forces who reached Korea created an atmosphere of suspicion and fear. Some Confucian scholars like Yi Hang-no (1792-1868) reacted with the rejection of Western barbarians and the praise of superior Chinese culture. Yi was for not using Western goods and for developing the strength of resistance. Interior 2, Unhyeongung - Seoul, Korea. Many ways were attempted by Koreans when they met Western ideas and faith. Some embraced Catholicism and were martyred. Some completely rejected the foreign religion as destroying Korean values. At the time of Tasan, Ch’oe Che-u (1824-1864), the founder of the Tonghak movement, who was well versed in the Confucian classics and had some knowledge of Catholicism developed his own approach to relate Confucianism and Christianity but he was condemned by the government as a heretic. Unfortunately there were not enough Confucians as Tasan who could have matured the reception of Western ideas, succeeded a true dialogue and contributed to the modernization of Korea. The French missionaries who came to Korea, at the beginning in secret, thought only to evangelize. 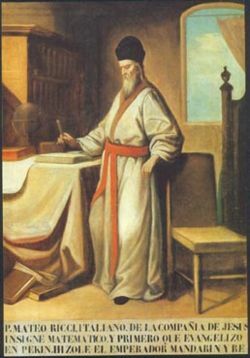 They did not, like Matteo Ricci in China, study deeply the Confucian culture and did not exchange with important scholars, whence many misunderstandings resulted. The history of Korea from the second part of the nineteenth century to the second part of the twentieth century became very complex and confused due to the intrusion of foreign powers not just from the West but powers of the region like Russia and Japan. The fatal blow came with the annexation of Korea by Japan in 1910. The annexation not only humiliated Korea but undermined its own identity. The Japanese worked at erasing Korean language and culture, forcing Koreans to use Japanese and practice Shintoism. A Japanese professor, Takahashi Ko, of Keijo Imperial University in Seoul, predecessor of Seoul National University, in 1926 presented Korean Philosophy in negative terms leading Koreans to consider their own tradition as superstitious, barbarian and unscientific. This negative image remained implanted in the mind of many Koreans and allowed an inferiority complex toward Western Philosophy. In linguistics and literature excellent Korean specialists during the Japanese occupation and after the liberation of 1945 did a remarkable work to conduct precise researches and to look for protecting what was specifically Korean. Such work was more difficult to realize for Confucian and Buddhist Thoughts as Western philosophy became more and more influent. The trend has never been reversed to that day. Philosophy departments in Korean universities essentially teach Western philosophy and popular publications thirty to forty years ago dealt with European philosophers such as Heidegger and now deal with Habermas, Foucault or Derrida. However Confucianism was never completely denied like in China at the beginning of the twentieth century or under Mao Tse-toung. Korea is even known to have maintained a continuation of the Confucian scholarship. Due to historical events, scientific studies restarted late in the 1960s but they are getting a new momentum. A generation of young Korean Confucian scholars came out of Sônggyun’gwan and presently publishes and teaches on Confucian values. Korean Confucianism needs to be reevaluated within the global context. Cooperation between Asian and American scholars symbolized by the relation between de Bary and Wing-tsit Chan has allowed Western scholars and public to discover the importance of Chinese Confucianism and Neo-Confucianism. Confucianism did not develop a hierarchical religion or did not elaborate a theology and yet it kept high values and spirituality. This is attractive to people who are disenchanted with rigid religious institutions and by religious conflicts. Confucianism has always emphasized harmony, peace, and caring relations with people. Such a fundamental attitude allowed Tasan to exchange freely with the Buddhist monk Ch’oûi, sharing on philosophy, poetry and practical issues like planting tea trees. The two were blind to narrow-minded points of views. Confucianism has a great sense of nature and of the environment perceiving man in unity with the whole reality. At a time of formidable ecological problems, the encounter with great minds as Yulgok or Tasan would raise the level of awareness and responsibility in protecting the universe. 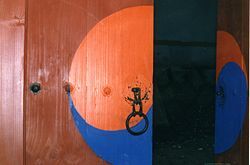 Although Korea looks westernized and even Americanized in many ways, Koreans are internally searching for their own self as it was illustrated by the theme of the 2000 Seoul academic conference: “Korean identity in the new millennium.” Behind the surface a deep Asian mind remains hidden. Koreans thinkers have researched so much the issues of the mind in Confucianism and Buddhism that these treasures have become part of them. The self-education, the adequateness of emotions, the beauty of true rites, the cleansing of the heart or the strength and sincerity of the will have been dearly valued during centuries and could contribute today to balance the fast modernization, the inclination for materialism and the spreading of a superficial culture. All links retrieved April 23, 2018. Confucianism and its Impact on Korean Culture: A Short Discussion. This page was last modified on 23 April 2018, at 15:51.